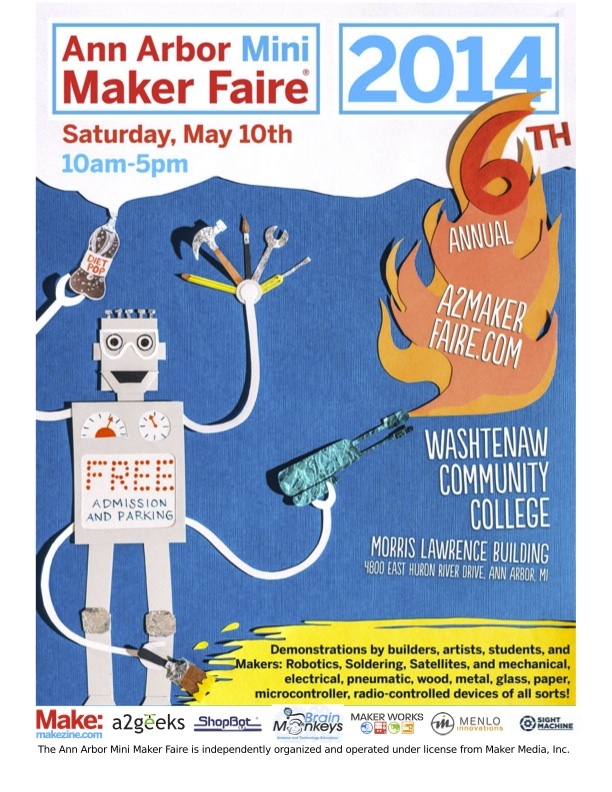 The annual meeting for A2Geeks, a local nonprofit that helps to organize the Ann Arbor Mini Maker Faire, will be held at 2:30 at the Faire. A2Geeks is about “supporting creative and innovative people in the Ann Arbor area by opening the tech culture to everyone” and hosts events like the Mini Maker Faire, Ignite Ann Arbor, and hackathons in SE Michigan. The nonprofit also partners with local groups to provide financial and other support to events and projects in the Ann Arbor area that fit this mission. This meeting is open to the public and will be a great opportunity to meet and network with fellow geeks, creatives, or tech-minded folks. Representatives of local tech groups are especially encouraged to make a brief statement about their group’s activities. We define a geek as anyone who combines knowledge with obsession in any field, whether in a machine shop, a kitchen, or an emacs terminal. I am originally from Portage, Michigan. I am a graduate of the University of Michigan with a Bachelor’s in Aerospace Engineering in 2010 and a Master’s in Aerospace Engineering in 2013. In 2009, I founded the Michigan Autonomous Aerial Vehicles team, a student competition team at the University to compete in international unmanned aerial vehicle competitions. I taught Introduction to Aerospace Engineering for 3 years at the University of Michigan. In 2012, I cofounded SkySpecs with two colleagues from U of M. I was recently awarded the Crain’s “20 in their 20’s” award. John Bowditch is currently Director of Exhibits Emeritus at the Ann Arbor Hands-On Museum. Previously he was Curator of Industry at the Henry Ford Museum and Greenfield Village where he was responsible for the care and maintenance of perhaps the greatest collection of steam engines in the world. Bowditch has worked with steam for over 40 years. In the early 1970s, he installed a fully operational historical steam engine at the Boston Museum of Science that ran on live steam every day for over 20 years and which weighed over 20 tons. In 1974 and 1975 he was an associate engineer at Scientific Energy Systems Corporation in Waltham. Massachusetts where he worked on the design and fabrication of steam generators for experimental steam powered automobiles. He has given many lectures on the history and operation of steam engines over the years. He is a licensed stationary engine in the City of Dearborn, Michigan. Ed owns Ann Arbor-based ENCarlson Enterprises, a consulting business that performs engineered-product design, project management and business renewal. He has more than 30 years of leading industry experience, primarily in the aerospace gas turbine engine industry for companies such as Pratt & Whitney, EG&G and Safran Group. Ed started his career as a project and manufacturing engineer for military jet engine programs, and later advanced to become the President and CEO of a major jet engine test cell engineering company, supplying engine testing facilities to global commercial and military aviation markets. He is a graduate of the University of Michigan with bachelors and masters degrees in Mechanical Engineer, and also earned an MBA from the University of Minnesota. Ed is a member of the Jackson Inventors Network, the Engineering Society of Detroit, and is active in MiQuest as an ambassador for the GLEQ business plan competition. John D. Hopkins is the chairman and founder of the Jackson Inventors Network, active for 3 ½ years and helping many inventors from idea to market. He is also the chairmanof the Michigan Inventors Coalition, a group that is dedicated to help grow and sustain Michigan’s economy by facilitating education, collaboration, and cooperation amongMichigan inventors, inventor support groups, maker groups, and Local MichiganEconomic Development Groups. The winner of the Jackson County Chamber of Commerce 2013 “Entrepreneur Vision” award he is very involved in the chamber, Jackson Area Manufactures Association (JAMA), Jackson 2020, Jackson Citizens for Economic Growth, the Microenterprise Network of Michigan, and the device committee for MichBio. John holds 3 patents for medical device, one is for a surgical instrument cleaning system that cleans 9.9 million more cells per cell left that the AAMI or the national standard, has a dozen or more products in the market, consulted more than a dozen companies into new markets, such as from auto & aerospace into medical. He has a BS Architecture, been NCARB intern, has a minor in Structural Engineering, & Urban Planning, held his residential builders license for 30 years, been a city of Lansing building inspector, designed over 100 medical facility projects from nursing units to doctors offices to surgical suites. Hung is an iOS designer and developer at FarmLogs, an Ann Arbor startup. In his spare time he buys and tinkers with gadgets in his quest to make the home of the future. Save the Date! 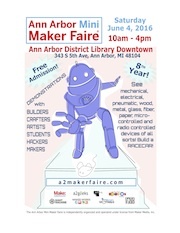 Sixth Annual Ann Arbor Mini Maker Faire! 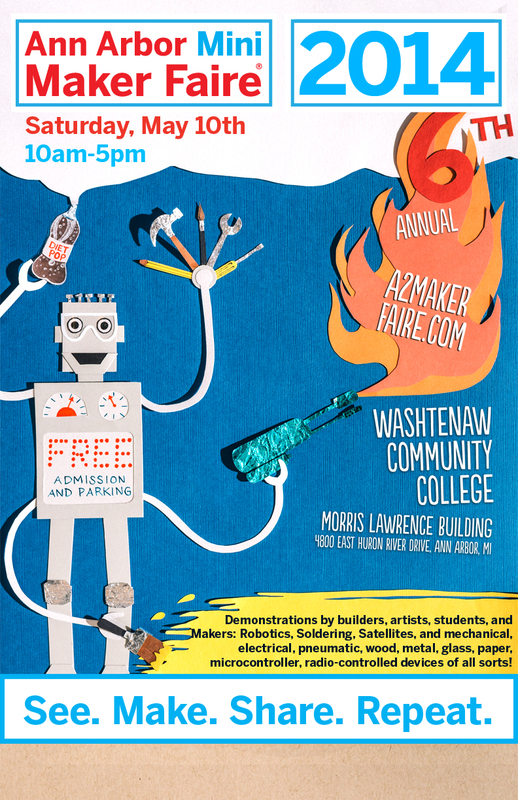 May 10, 2014 marks the second time the Ann Arbor Mini Maker Faire will be hosted by Washtenaw Community College. This free, all-ages event features community members of all types who come together to display their ideas, projects, and inventions. Soon we will be seeking applications from people and groups with engaging, inspiring, and just plain cool projects. Projects should have a focus on the process of creating, designing, and making – not just displaying a final product. 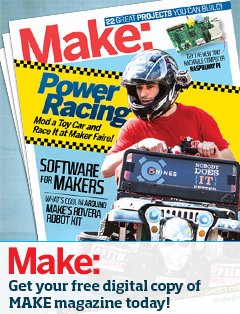 Makers of all ages and experience levels are encouraged to submit applications We will begin seeking applications for makers in the next few weeks.